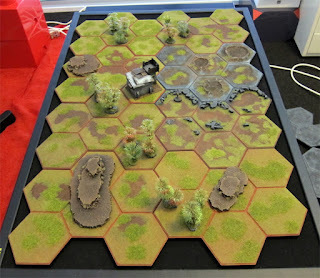 Last year before I left the UK, I bought a set of Hexon II terrain system from Kallistra. This is an injection moulded plastic product that allows you to model a sturdy layout that can be stacked in pieces for storage. I will admit that the storage aspect was what originally drew me to this product, as someone who is usually very pressed for space. As the underside of the tiles are hollow, it is also possible to model detail onto the tiles that will be protected while stored. The second interesting feature is that as the layout is composed of hexes, forests or other rough terrain can be very easily delineated. I bought the set unflocked to allow me maximum modeling potential, but to be honest it took a really long time to get these finished. If you only want grassy hexes, I would recommend the pre-flocked variety. The tiles come with clips to keep them together, but I found that using my neoprene pin-board as a base meant I did not need them. By bizarre coincidence, it is also the exact right size to accomodate a 4x2 tile layout. Speaking of layouts, because of their hexagonal nature, it is possible to arrange them in a hexagonal pattern instead of the usual square or rectangle. 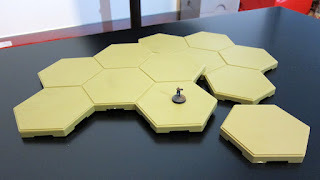 I think this has some tremendous possibilities, such as designating the six outermost hexes as deployment or reinforcement zones that can be easily randomized with a simple d6 roll! Now that I have gone to all this trouble, I'm going to play a few games on it to see how useful they turn out to be. 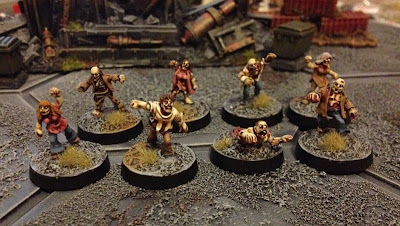 I originally painted them all in a grey color with the intention of using them as a cityscape... But they just didn't look right. After adding some browns and grass they really came alive, so I think for an urban layout I will be better off making some cork tile squares with roads built in. ...And you're in a world of hurt! Here are my old trees ripped off their CD bases and glued to some new cork tile outcrops. 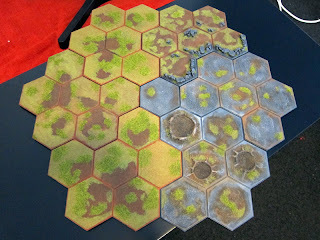 This allows me to position them within a hex (or forest area if not using my Kallistra system) or to place as individual terrain pieces. 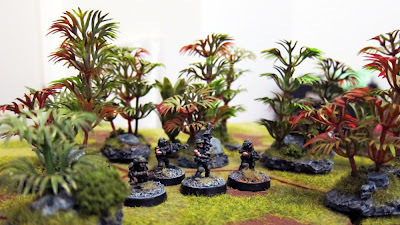 I like how they look with miniatures as seen here, and will probably make some more in future, as I have plenty of aquarium plants left and cork tile is relatively inexpensive. 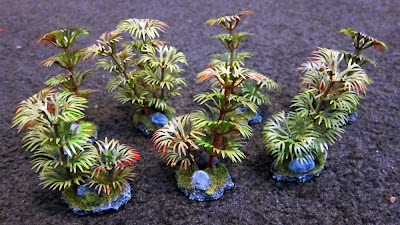 I'd like to make some kind of low scrub to go with these, perhaps reindeer moss is the best way to go. 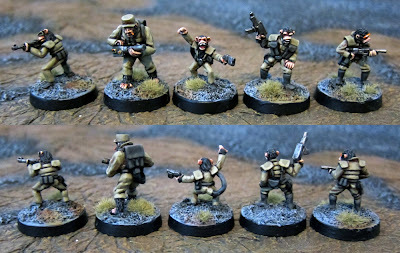 The troops pictured are my remaining Khurasan Exterminators. 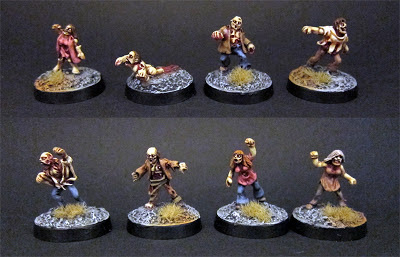 I now have them all painted up, which took over a year - It's nice to have them completed. I got these from Rebel Minis recently, and while I really liked the sculpts in general (especially the dual pistols!) I wasn't so keen on them all sporting the "bald with goggles" look. The one on the far right get of putty hairpiece, and the guy on the far left got a GZG head swap. I painted them up as mercs or bounty hunters, so tried to make them look as different as possible without resorting to bright colors. I'm very pleased with these figures and I think they will get a lot of use on the tabletop. As you may have seen in the feed, I've been toiling away at my Crusty Walkers. Here is the first complete one, decked out to match my Crusty Power Armor troops. All are from GZG, and are excellent sculpts. Some of the edges are a little soft, but for alien crustaceans, it's OK with me. I went with an orange armor scheme, with Russian green suits underneath to tie them in with my other Crusty troops. I did all the weapons in white to show them as distinct from the dirty metal guns the rabble troops carry. These all took quite a lot of effort due to the mechanical detail. I have actually got another 3 suits almost finished (weapons and bases to go) but they are identical poses, so I thought I'd throw out a post with these 3 done. 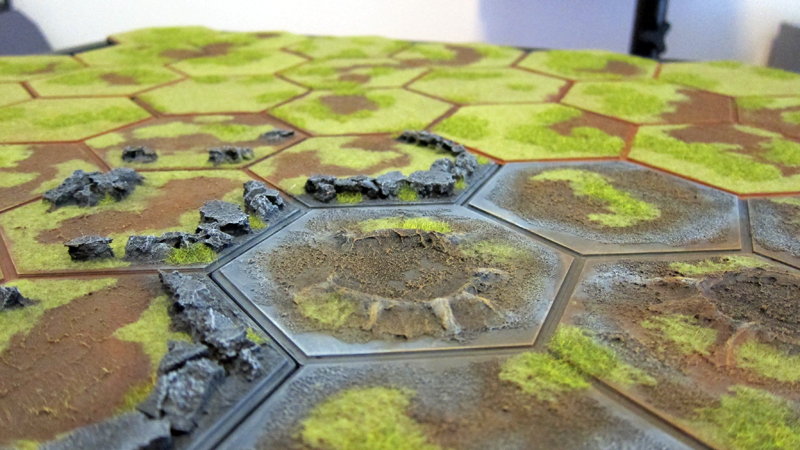 I'm working on my Kallistra Hexon terrain boards to have a little more space to get troops on the board. For what? For FUBAR! I played 3 games over the weekend and I think it's a great system for playing Platoon Forward (In space) as it's light and points-free. Since my boards are quite small, I have adapted the weapon ranges and firepower values to suit. In my variant, each weapon type has varying FP depending on range. It worked out very well in my test games, as the rules are so simple to start with. With this system, a combat shotgun behaves differently to an assault rifle for example, which I like. The (extremely flexible) Platoon Forward scenario generator includes things like squad support weapons and AT guns.. Something I lack in general. 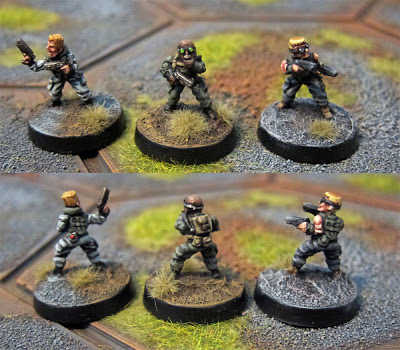 I am going to need to order some big guns (probably from GZH again) in due course, but I think I'll start the campaign without them or see what I can convert in the meantime. My next step will be to generate my platoon, which should be fun! I'm going to use my 5150 definition of a platoon here... 3 fireteams of 4 men each plus a "Platoon" commander. Can't wait. Not a lot of time to paint lately, but as you might know, when I can't get a solid stretch of painting in, I make terrain! Or in this case, re-using some older terrain (Proxie models ruined walls) by making it into ruined buildings instead of free standing separate walls. 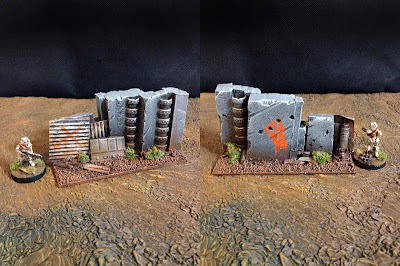 They are a great product and I'm considering buying some of the corner ruins to expand my set. A little bit of pumice gel to blend them into the bases did the trick very quickly (as they were already painted), but I wanted the interiors to look a little nicer than just throwing some dirt in there. For building number one, I used a slab of Imex on the left, with a few spare tiles cut out of plastic. On the left I used some textured paper to look like cobblestones. I think this piece needs a little more work on the floor, probably checkerboard tiles. They are cheesy, but they are effective. Speaking of alternating tiles, the second building featured a second level sniper perch. Both the tiles and the cracked floor were made by carving into foam core with one side of the paper peeled off. It's a great alternative to carving pink/blue foam and I find it really easy to handle. A little bit of pumice gel to add interest really set this off. Building number three features a wooden floor made out of popsicle sticks split in half and cut up. The mesh on the left was supposed to be old carpet, which I may still do by glazing it. On the workbench are GZG Crusties and mechs, because I want to expand them as an OpForce. 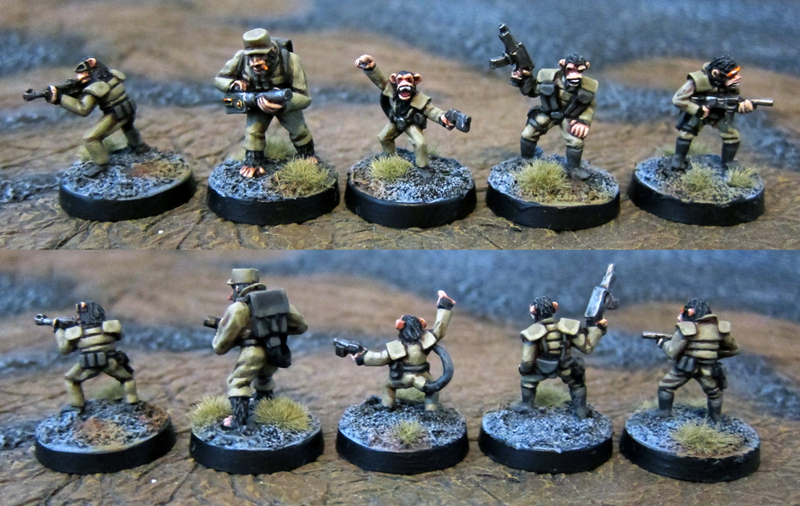 This is to take a run at Platoon Forward by Toofat Lardies, using Fubar rules. These ruins will feature heavily in this project too. I have (of course) come up with a few new projects I'm excited about that will further stress my free time, but I'll post about them when I actually do work on them. This is a Blue Moon Shivan I had half-done (see a trend here? I'm trying to get all my incomplete minis completed) a while ago and finished up recently. 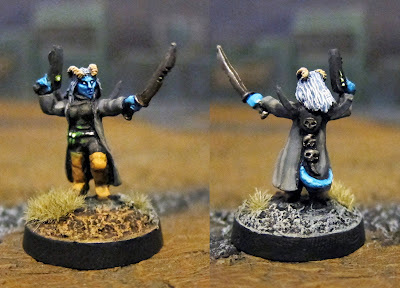 She is partnered with the model I painted in this post. I went with drab colors to draw out the skin tone, but I might try something brighter on the third member of this group. I should mention the metallic parts of the model are very easy to do and I really like the look. 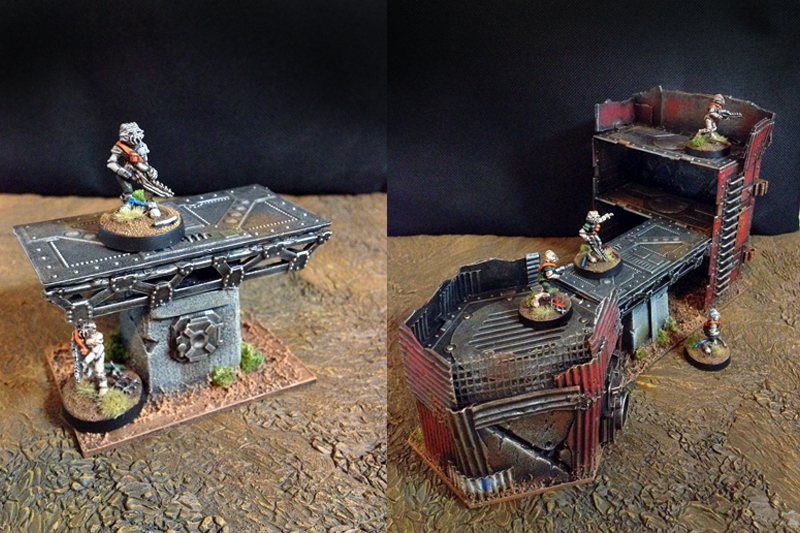 Old Citadel boltgun metal painted on solid, then a wash of New Citadel Agrax earthshade. That's all.. As the new washes are quite thin, it comes out looking weathered but not quite rusty. I'm feelng the need to consolidate my terrain again, which isn't very difficult. I'm going to split my collection into City Ruins and shanty town. 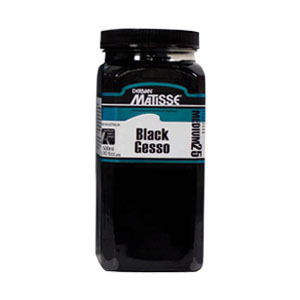 This will help keep the basing consistant and the colors looking cohesive. 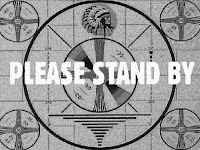 I may post a little about this as I go about it, depending on my mood. 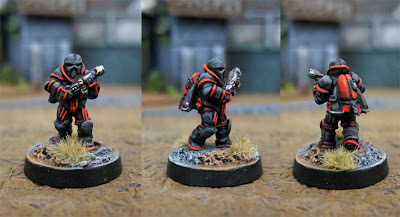 I have had this smartgunner and her tech compatriot undercoated and half-painted for months now, and in an effort to move on to the vacc suit exterminators (all from Khurasan miniatures) I've been finishing off these two and doing further highlights on the rest of the squad. These figures have a ton of detail. 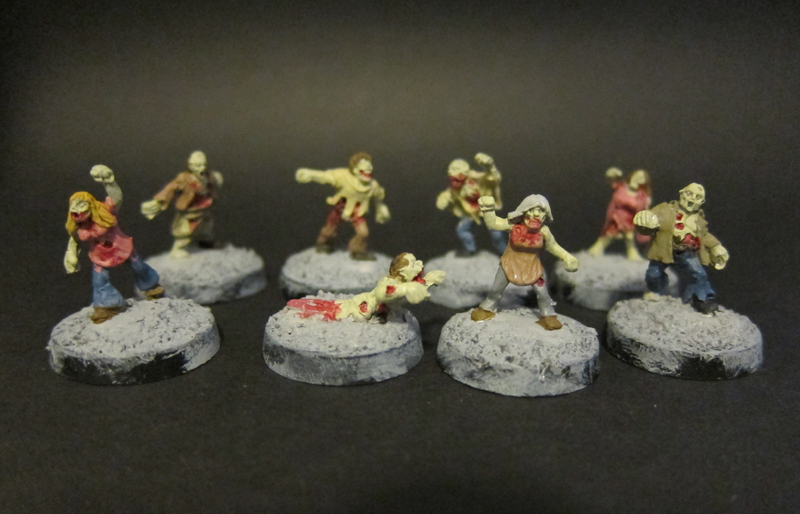 They were actually quite difficult to paint if I'm honest, but they are very satisfying to get finished. There are two models missing from the set, which I used a different color scheme on and I really am not happy with. I need to get some Dettol tomorrow and strip them so I can complete the set. The faded fatigues look makes them look very "Vietnam war" to me, and I'm glad I got away with avoiding camo, which I feel works poorly in 15mm scale. 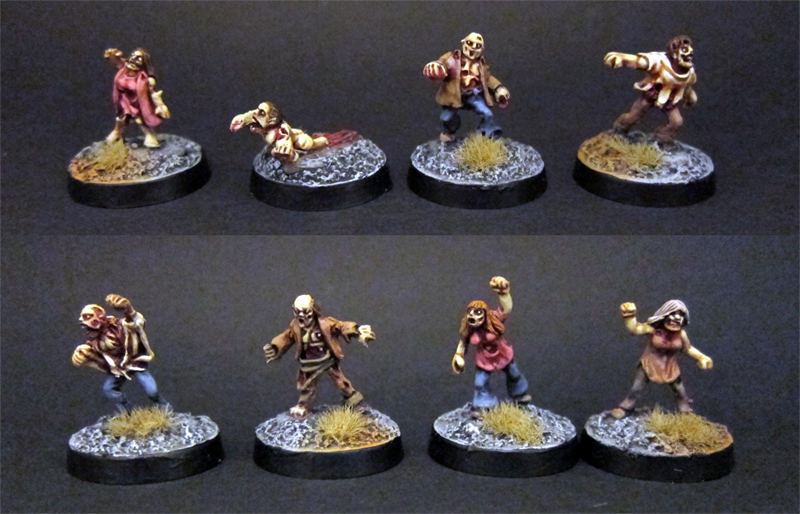 I have some additional support figures on the way, which will be fun to round out the unit with. 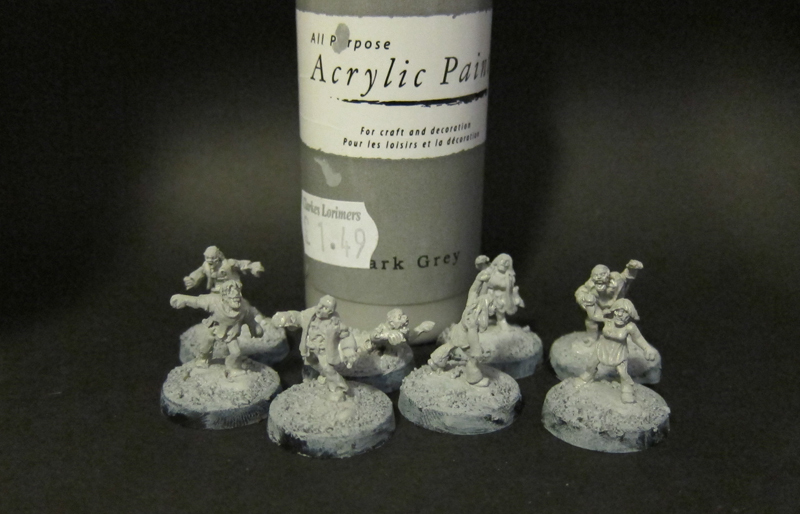 I think I'll pit them against my Crusties once I get hold of some dullcote and seal them all. I painted this guy recently just for fun. 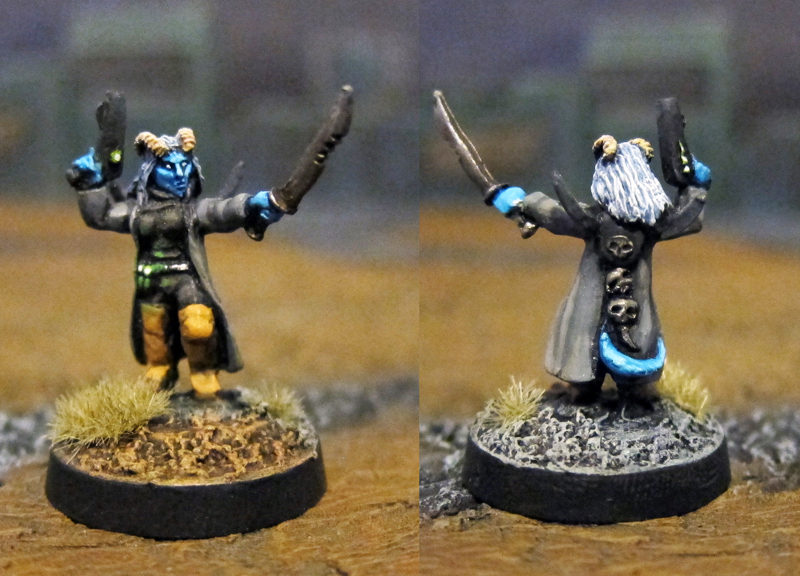 He is a 15mm.co.uk "Disciple of the redemption" from the Laserburn range. 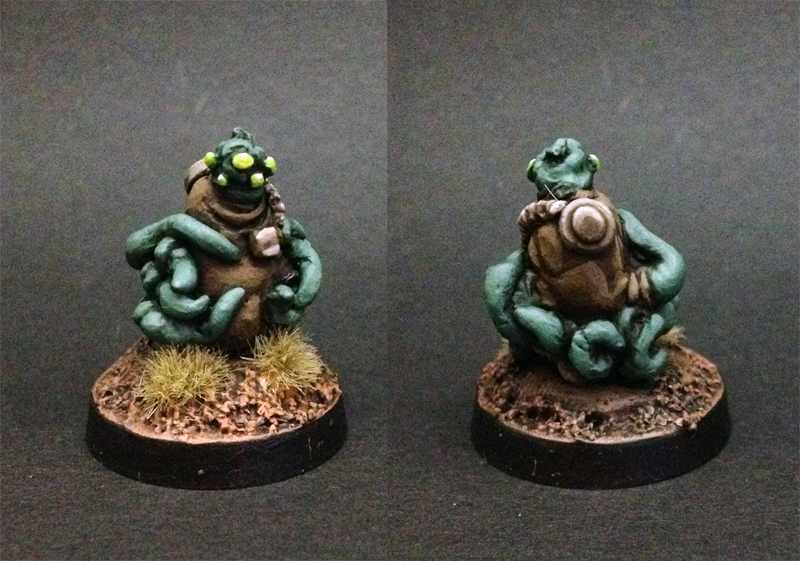 As usual, the Laserburn sculpt reveals more goodness the more you paint it. In my games he will be a terrifying jetpack-equipped bounty hunter. I went with a simple red and black scheme, but his armor is so interesting you could approach it a variety of ways and look good. I have also added some grey drybrushing to my 45cm skirmish board to encourage me to play some test games of my homebrew rules. I have boiled down for the millionth time what I like in a solo skirmish and why. This is the reasoning behind my latest effort. Simple is better than complex. Its hard to keep too much in my head when playing solo, and checking a QRS should be infrequent as possible. A system you can easily remember is key. Suspense is important. As there is no opponent, suspense and surprises are the fun part of the game. I would like integration with my solo roleplay efforts. This is out of left field, but solo rpg is something Ive found fascinating since I discovered it via blogs. Keep the scope narrow. Don't try to make a game that does everything. Narrative! I like games that are aimed at creating cool narrative over crunchy simulation. So here's the start of what I came up with. I was obsessed for a long time with the card draw mechanic from TRWNN, as its excellent. The problem is you need to make custom decks or translate numbers.. Too much effort. Instead I adapted the activation system I have read is used in Victory Decision. The player (this is solo remember) chooses one of his minis, and selects the closest unactivated enemy model. Both dice for activation, the winner activates (each mini can only activate once a turn) when all minis have acted, turn over. This is the cool part. Rather than making a solo rpg session before and after the battle, the solo rpg mechanics can be used DURING the battle. My squad scouted an encounter token and discovered (via Yes/no/and/but dice questions) an abandoned transport truck... Inside was a bunch of unmarked gold, which the enemy were obviously there to steal! The gold was not easily transportable and the vehicle was inoperable despite frenzied attempts to get it running, so the squad demo expert tried to booby trap the vehicle.. Which went wrong and exploded prematurely. The squad pulled out as the enemy secured the area. They would need to either come back with heavy equipment to liberate the gold (Kelly's heroes scenario maybe) or leave it to the enemy. This was all generated on the fly with no charts or prewritten scenario, just logic and interpretation of dice. Each action spent on moving gives you one roll of your move die. I find random move distances really add suspense to a shootout, especially when running for cover. It works beautifully in TRWNN and also in CROM. I'm sold on it for solo games, especially using the poly dice where a slow character moves d6 and q fast one moves d10. Opposed roll, difference in hits. Roll to save hits, remaining hits have a cumulative damage effect. A low hits total will give you a knocked down or a few more will yield a flesh wound, hampering your rolls by -1 depending on what body area was hit. A high unsaved hits total can take you out on the spot, or cripple you so you cant move for example. Flesh wounds are tracked by placing red markers/counters on your character card in the relevant body zone. A wound to the arm inflicts a -1 to shoot, to the body -1 to guts rolls, etc. At the start of your activation you must roll higher than your total number of flesh wounds to stay conscious. This keeps record keeping relatively easy. Sure its a little bit fancy, but this game is for 5 or so models per side so detailed damage is more interesting and narrative than not having it. Thats all for now, but I'm pretty excited about this little system. (I should have brought some Lego micro-figs along for test games in the hotel. 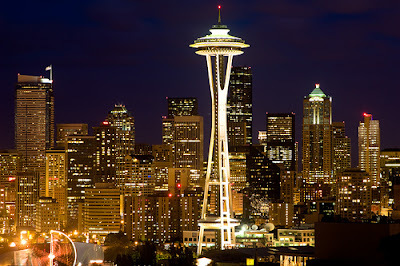 I'm off in the morning, back on a jet, back to the USA, for my first PAX Prime gaming convention. 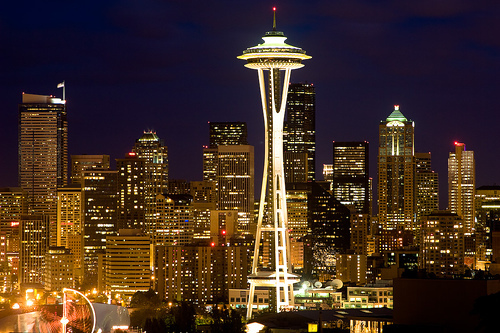 I'll hopefully be taking some photos, but if you don't hear from me in the next week, it's cause I'm on the road. When I get back, I have a week off that I plan to spend at home working on some music.. And of course painting a few minis! As I was leaving the house today, I found a little brown paper packet in my mailbox. As you can see, it was my 15mm figures for "The Department" hand packed by the splendid Joe Dragovitch himself! I bought the PDF for this game a few months ago when I moved back to Australia and it was a fascinating read. I'm not a background story kind of guy, as I prefer to make up my own. The Department however has a genuinely interesting premise and is tightly focused around the idea of "Fabricants" and their role in society. The book is not choked with fiction, but what is there is thoughtfully placed and well written... I really enjoyed it. The system is basically Goalsystem, which I think reads very well but have not played. Additionally, the game is designed to be co-op or solo without a GM. This is very rare and exactly what I look for in a rulebook! The solo element is handled by a set of AI charts that govern the actions of the non player forces. It's quite simple at first glance, but pretty ingenious. The short version is you create some characters and then run your police unit (complete with Internal Affairs interference and evidence points) as you track down a master criminal. It is a unique and very well conceived game. The important word here is "focus". This is a game that does a great job of making you feel like you are conducting an investigation (I was reminded more of "The Wire" than Blade Runner) and dealing with encounters than full-on battles. This is not a game of pitched battles. In theory you only require a handful of figures to play, so the accompanying minis line is a good start. I would imagine a variety of civilians in suits etc. would be useful as well. I think a pack or two from The Scene and Rebel would sort you out for most games. Why haven't I played it? Two reasons. The first is time.. I just don't have enough to myself lately, and when I do it's been spent desperately painting. The second is fuss. Huh? Central to the game is the character sheet, and the one in the book makes me want to design my own. Which of course I don't have time for. Also, I don't have any city terrain, which I feel is important to use. To close, the minis are fantastic! great sculpting, clean casting, oozing with character. And at three pound fifty SHIPPED TO MY DOOR, represent incredible value. Sculpted by Eli and sold by 15mm.co.uk, this is another alien denizen figure that I did while painting the shacks in the last post. I like to have a single figure to pick at while I'm working on a larger group of things to make best use of my painting time. To be honest I dislike painting 'units' in the traditional way, but sometimes it needs to be done. This fellow/lady was painted with Vallejo Gunship green and English Uniform.The eyes are lime green and his breather is some kind of buff color with earthshade wash applied. This figure has all kinds of uses in sci fi or even Mythos gaming. He was quite fast to paint and took to the brush very well. As you might have seen in the workbench feed, I'm dusting off my old 3d spaceship terrain modules and have them all ready to play with! The main thing I did was standardize "connection points" by placing a grating square where each module is supposed to join to the others. This means I can use them for a quick layout generation system I've whipped up. I will do a full post about them soon. I've been terribly busy with real life, especially work etc. etc. However I have managed to put these buildings together while watching a crummy movie with my girlfriend on the weekend. I find terrain building is relaxing and pleasant when one is too tired to paint a "proper" mini. 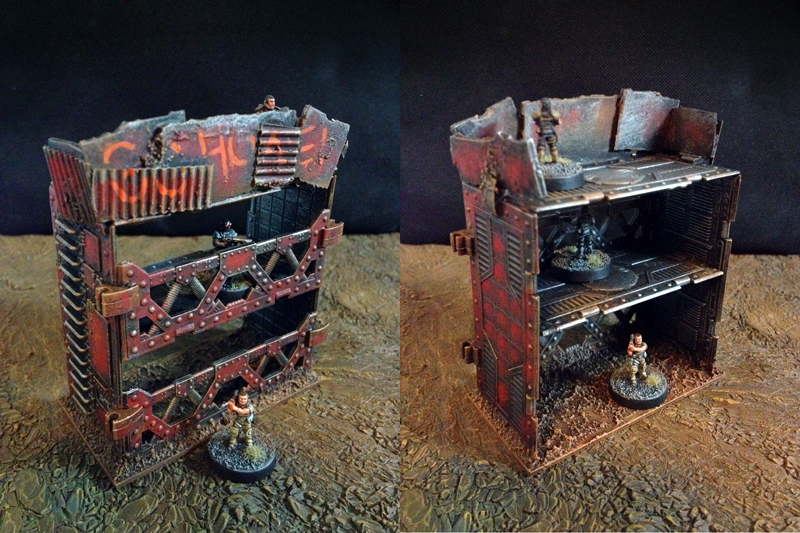 This first building is made mostly out of some rescued blocks of blue foam (ripped off my old vault terrain tiles). 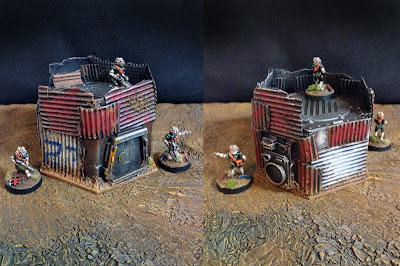 The corrugated metal is paper from an art supply shop, the front door is a GZG metal one, and the back wall is an IMEX panel. Finally, there is an air conditioning unit by The Scene on the side. The whole deal is mounted on a plastic base textured with pumice gel. I finished it off with a little bit of foam shrubbery. 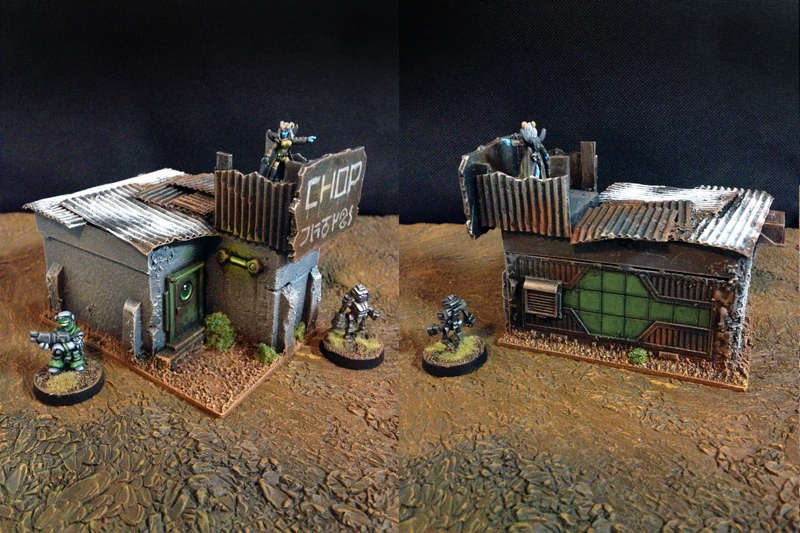 This hexagonal building was made of foamcore, with an IMEX roof and plenty more corrugated paper. Another GZG door and large aircon unit complete the picture. These walls were recycled vault terrain, with some more corrugated paper and chopped bits of junk glued on. This tower is made mainly out of IMEX parts, with some ripped up plastic sheet and corrugated paper to fortify the top. Most of my terrain is one-story, so it was about time I made some high ground. This last piece is another IMEX part, mounted on a block of blue foam with a GZG hatch glued on. As you can see, it makes a great bridge between two other terrain pieces. These pieces were all easy to make and cost me nothing as I recycled them out of old junk and unpainted lead. Combined with my existing GZG shanty shacks they round out a pretty respectable sci-fi or post-apoc settlement to game in. 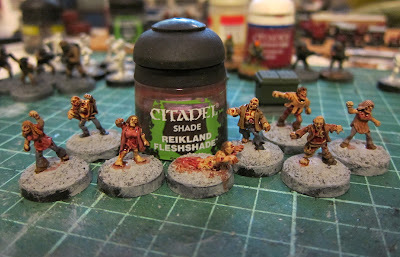 I painted these up tonight in about an hour while listening to my favorite Podcast, Minions of the Monster Master. It took me about two hours and I feel like a great weight has been lifted from me as I finally got some hobby time in!